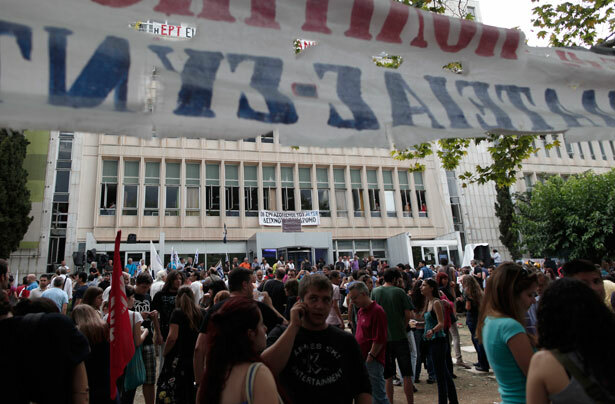 After the government announces the closing of ERT by fiat, staff occupy the building as protesters gather outside. A couple of hours ago I spoke to Marilena Katsimi, an ERT journalist inside the Athens building. She said that when the rumours of ERT’s impending closure first surfaced two weeks ago, nobody took them seriously: “We just couldn’t believe they would do it.” But all day today the director was shut in his office, not speaking to anyone. At six o’clock, New Democracy minister Simos Kedikoglou announced that ERT was being shut down because of “a scandalous lack of transparency” and waste and abuses by its bloated workforce. Katsimi found his statement deeply offensive: “He actually said ‘the party’s over,’ when it was their party. Since this government came to power they’ve been buying in expensive programs, bringing in their own people, hiring thirty or forty consultants at 4,000 euros a month when our salaries have been cut by some 40 percent and we’re making 1,000. How dare he tell us we’ve been having a party here!” Last year Katsimi was suspended from presenting a morning television news show because she referred, somewhat sarcastically, to a threat by the public order minister to sue the Guardian for reporting allegations that the Greek police had tortured antifascist protesters. Of course, sucessive governments, both PASOK and New Democracy, have long given jobs at ERT (and elsewhere in the public sector) as prizes to loyal supporters. Everyone has heard stories of “journalists” drawing fat salaries and never showing up in the office. But as the blog Crisis Republic points out, the new, streamlined state broadcaster promised by Kedikoglou (at some vague point in the future) will look much like the old one—except it will be staffed entirely by this government’s supporters, at a cost in compensation and new salaries of several million euros. So, in the name of transparency and cutting costs, the government has closed, by fiat and at great expense, the country’s only public broadcaster—the only broadcaster (for all its flaws) that isn’t pushing the agendas of the oligarchs. It has laid off some 2,700 people in one fell swoop—exceeding the Troika’s demand for 2,000 more public-sector job cuts. And it has opened the way for the distribution of lucrative franchises—for sports broadcasts, for instance—to the private TV channels that feed the Greek people the relentless diet of pap, hysteria, conspiracy theories and xenophobic propaganda that has helped sink the country into its current mess. Last week, Turkish TV notoriously showed movies about penguins instead of the police repression in Taksim Square. Greek TV has been poisoning people’s minds for decades; penguins would be an improvement. The closure of ERT is the most dramatic in a series of attacks on free speech and public space by the Greek government. It comes as the official story of the austerity program’s success has been undermined by the IMF’s admission that serious mistakes were made, and by the Russian giant Gazprom’s failure to bid for the state-owned energy company. Greek friends are asking each other, Is this the beginning of the end? I couldn’t say; but in tragedies, killing the messenger is usually a sign that things aren’t going well. Is Bradley Manning more heroic than SEAL Team 6? Read Chase Madar's argument here.